Hillhead is located at the head of one of the many hills in the Coteau des Prairies Hills, in Labelle Township, Marshall County. The town was established in 1915 when the Fairmont & Veblen Railroad was extended from Veblen to Grenville. A Post Office was opened in 1916 under the name Airmont. But the name apparently became confused with Fairmont, ND, and the name was changed to Hilltop. 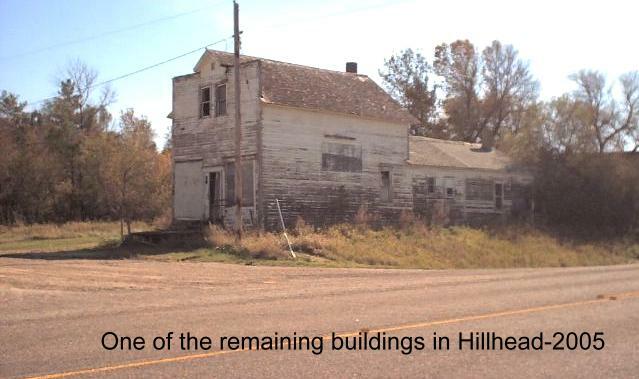 Then when it was determined there was another Hilltop in western South Dakota,the town's name was changed once again to Hillhead in 1917. The town grew quite rapidly and supplied area farmers and ranchers with a variety of supplies and services. Hillhead reached its population peak from 1920-1927. HILLHEAD - When Chuck Guy was a little boy, he remembers playing with a sawed-off shotgun with a big legend. The northeastern South Dakota native heard his dad tell the story of the time in the 1930s when four notable gangsters went through the community, leaving an arsenal of weapons at his father's farm. His father, Clarence Guy, was concerned that the guns were there and hid them in plow furrows. "We farmed it after that. We plowed it. We always watched for it. We never found any," Chuck Guy said. One gun in the family was reported to come from the gangsters, however. Chuck Guy, now 65, remembers playing with it in the outhouse as a kid, nearly shooting his brother when it accidentally went off. "I used to shoot it all the time," he said. Is the story true? The Guys believe it. While the details are sketchy and unsubstantiated, Marshall County Sheriff Dale Elsen also thinks gangsters spent some time in the area in the early 1930s. "I believe 'Pretty Boy' Floyd and the boys were here," Elsen said. "There's untold stories." From Guy's account, one of the men may have been George "Machine Gun" Kelly. The year had to be about 1933 because Guy's brother was kicked in the head by a horse and died around that same time. He was born in 1930 and was 3 years old when he was killed. Chuck Guy wasn't born until 1939, several years after the incident. His father was accused by people in the community of getting some of the stolen money to take his injured son to Rochester, Minn., for medical help. But that wasn't true, his surviving son said. "He told me he never got any money out of that robbery," Chuck Guy said. Later, the elder Guy spent time in the Brown County jail for his hospitality toward the gangsters, his sons said. Court papers from the National Archives in Kansas City, Mo., don't mention any gangsters but show that the elder Guy pleaded guilty to receiving and concealing stolen government property, specifically six Colt .45-caliber automatic pistols and four Browning machine rifles. Those rifles had been stolen from the National Guard Armory in Wahpeton, N.D., by an unknown party, court papers said. Court papers list three witnesses in the charges against Guy, three men who were at the federal prison in Leavenworth, Kan.
An older son, Clarence "Bill" Guy, 71, said his dad was surprised when he opened up a granary door and found the guns. His father figured the mob, possibly with the help of some locals, dropped them off and took off. didn't want to talk about the incident. Johnson, who has written stories about northeastern South Dakota in six issues of "Wagon Wheels," said the story came up when she was writing history on Hillhead. "I had always heard that story. It sounded like a good one," she said. You've heard of Al Capone, John Dillinger, Bonnie and Clyde, George "Machine Gun" Kelly and "Pretty Boy" Floyd. They're all famous gangsters. Did Capone, from Chicago, travel through northeastern South Dakota on his way to Saskatchewan for bootleg liquor? Prohibition in the 1920s and early '30s, the invention of the automobile and the stock market crash in 1929 fueled a criminal culture that included these robbers and kidnappers. Gangsters influenced some changes in law to allow federal agents to carry guns. Drove to Hillhead, north of Lake City. Two buildings remain along the main drag. ... My mom, who I took along for the ride, told me that a bar with a basement dance floor was the turning point in her and Dad's dating relationship in the 1950s. One night, he followed her to Hillhead, and although he was too shy to ask her to dance, he did ask to drive her home.